According to the recent report by Marketing Sherpa, “CMO Perspectives on B2B Marketing Automation” (offered for FREE by Marketo until March 1st), “the majority of CMOs have either implemented, are in the process of implementation, or are at least considering implementation of marketing automation software“. This is probably good news for the vendors, which are competing in an increasingly crowded market. Some have even suggested that marketing automation market is floundering, but it is such a new market and offering that is innevitable to have doubts, especially with these many vendors in the space. With time, a shake out is likely (in fact, the recent acquisition of Unica and Aprimo may point to consolidation) and the evolution of solutions will ensure marketing automation has a place in most marketing organizations, much like CRM is now standard for sales departments. So let’s take a look at the marketing automation companies in play today (mostly US based in this case) and when they were founded. Interesting to note that the majority of the players only came to existence not even 5 years ago. This nascent industry still has lots of growth to do. You may spot some companies that were not considered to be “marketing automation” players just a year or so ago. That points to the evolving nature of the market, and the key functions of lead nurturing, scoring, and automated triggers becoming part of email marketing and other marketing solutions. Marketing Automation Software Guide published a B2B Marketing Automation market map that shows a few other players I ignored for the timeline above, like SAP and Oracle because although they do have marketing automation capabilities it is not their core business (and I don’t agree with tagging Salesforce.com as a marketing automation solution). Another interesting factor to consider in the marketing automation industry and why it seems to be catching on fire is the money that is flowing towards some of the key players. 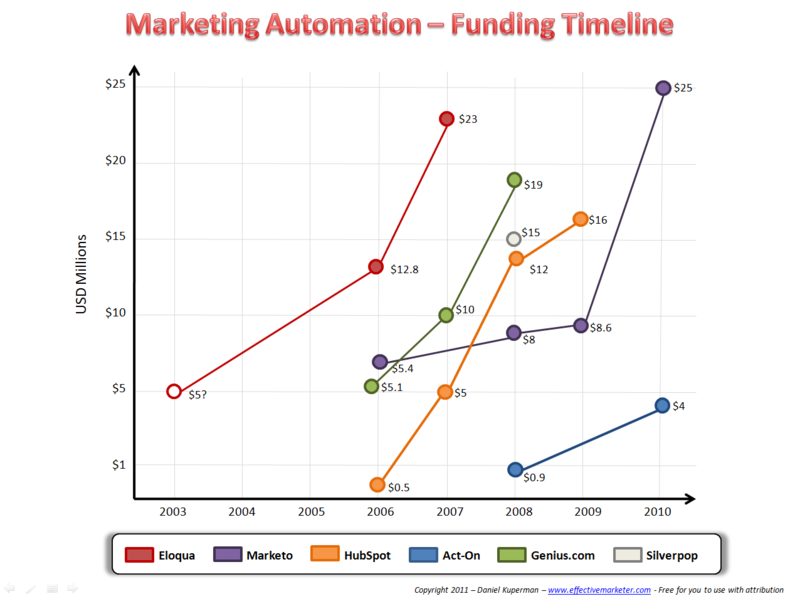 Just a few marketing automation companies have already raised over $170 million dollars combined. Whether they will all be around a couple years from now is still to be seen, but it does make for a highly competitive environment. With cash to burn, these companies are focusing on growing the customer base first, with hopes that revenue will follow. 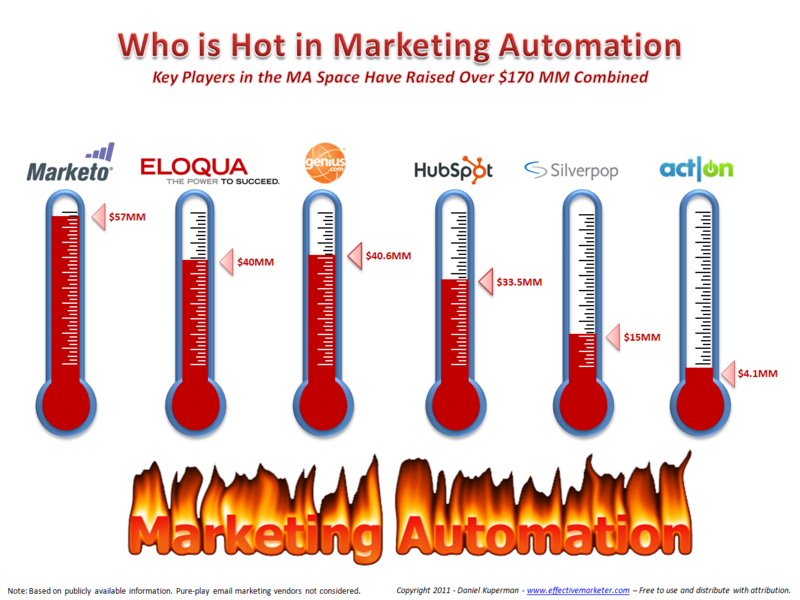 The marketing automation infographic above (click to enlarge) shows the top players in the MA space that have raised over $1 million dollars. Also interesting to note that if you break down the fundraising of each of the above vendors into a timeline (like I did below), most of the investment has been made in the past couple years. You may have to click to enlarge the funding timeline infographic above. Note: I used publicly available data and wasn’t able to find Eloqua’s Series A, so I deducted based on valuation of their second round. 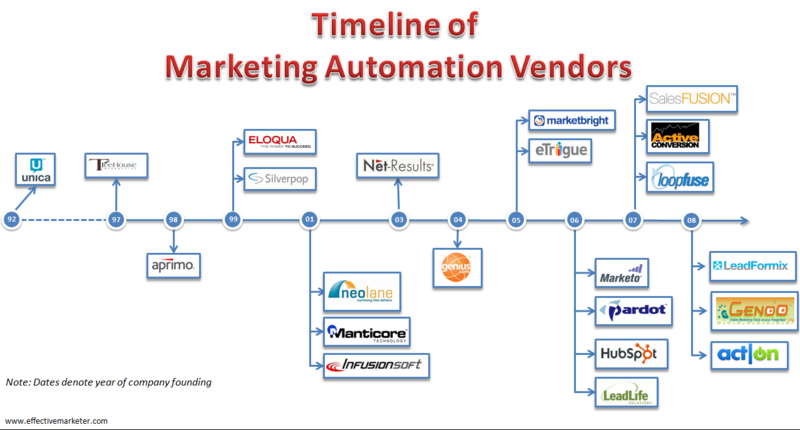 The Marketing Automation market is at an interesting stage. Companies are fighting for customers, trying to educate the market, and we may be seeing the beginnings of consolidation. Based on the investment figures above it seems is catching on fire, but at the same time there’s fierce rivalry and still a lot of room to improve… what will happen? I don’t know but it promises to be really interesting! P.S. Let me know if I missed any MA company in the graphics above or if I got incorrect data. I’d be happy to fix the infographics for benefit of everyone. This entry was posted on Wednesday, February 16th, 2011 at 9:00 am and is filed under Email Marketing, Marketing Automation, Marketing Management, Marketing Planning, Marketing Strategy, Online Marketing, Uncategorized. You can follow any responses to this entry through the RSS 2.0 feed. You can leave a response, or trackback from your own site. Many thanks Daniel for gathering these figures. Very helpful article. Keep going! Excellent post. Marketing automation is still in its infancy. Lots of new players to come, followed by lots of acquisitions and mergers. It is certainly a great time to be in this industry. Cool infographic! I think your wise to follow the money trail. Regardless of what people think about MA it’s getting funding, and it’s growing. Enterprises are beginning to add it as a budget item, and market research firms are starting to assign analysts and report-writing resources the growing niche. @Jacques, you’re right, is a great time to be following the industry. So much happening and new opportunities for everyone. @Greg, thanks! I agree, more companies are adding marketing automation and marketing software in general to their budgets. We will soon see more coverage I think of the market as it starts gaining momentum (recent acquisitions help publicize the space and pending IPOs too!). Really like the work you’ve done here. One data point concerns me. The Marketing Sherpa data is based on a sample of 300 CMOs. This overstates market penetration. ? A Forrester Report (B2B Lead Management Automation Market Overview, Sept 2009) says: “…we estimate that currently between 2% and 5% of B2B firms have invested in full-featured LMA functionality …” Eloqua (via CMO Brian Kardon) feel 5-7% market penetration is closer. Great article. Thanks for all of the information.